If you believe as we do, that we are presently living in the last days, then we can expect these kinds of glorious supernatural experiences to happen in our lives today through these unusual, yet Biblically common ways. While discussing the Biblical truths regarding heavenly dreams and visions, there will always be well meaning Christians, including leaders, who incorrectly believe these supernatural occurrences are limited to only that time in history. Others will wrongly assume it to be an extraneous Biblical subject, or one that is not important, valid or relevant to our everyday lives. Because of this, the teachings on heavenly dreams and visions are often discarded or overshadowed in favor of other Bible topics considered more worthy of attention. However, nothing could be further from the truth or more detrimental to hearing the voice of God in our daily lives. It is only when we begin to renew our thinking by embracing the Scriptures on this subject, thereby gaining the Lord's perspective rather than our own, that our personal experiences with heavenly dreams and visions will be greatly enhanced and the God-given benefits will be greater than one could hope or imagine. "Will we allow, welcome and even invite Him to do so?" It is important for us to understand that the heavenly dreams and or visions of those in 5-fold ministry will often be different in content than those of a lay person. The former will oftentimes deal much with the Kingdom of God and their specific ministry, while the latter will deal mostly with the person's daily spiritual, family and work or business life. We do not serve a "cookie cutter" God. He deals with each of us individually and uniquely. 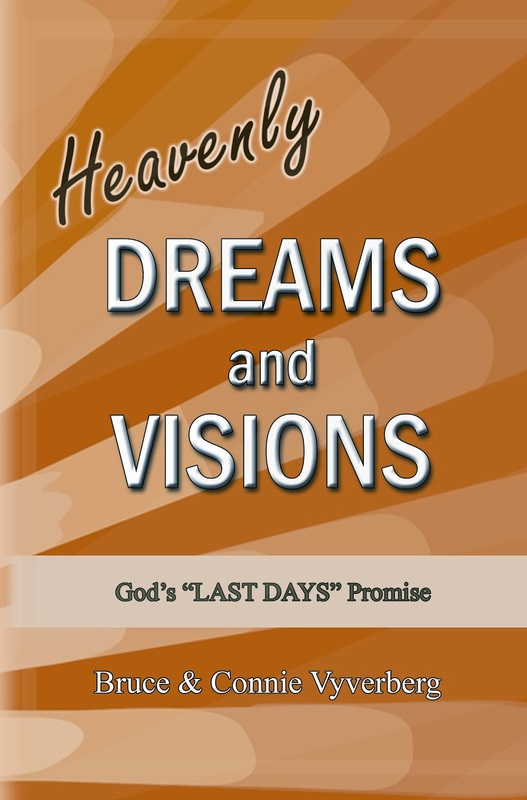 This book was written with a great desire to help people begin to recognize and then understand the intended meaning behind their own heavenly dreams and or visions. We hope that our personal stories and the teachings that go with them will help spark a greater hunger, love and intimacy with the Lord than you have ever known. We believe that once you become aware of the Lord speaking in your own life through heavenly dreams and visions, you will never be the same again. While it is one thing to read about such things, it is far more exhilarating and life changing to experience your own. Glory to His Name! Be assured that we take no personal pride in our spiritual experiences of heavenly dreams and visions. They are rather a holy and sovereign work of the Lord and are being used as testimonies to bring honor and glory to His name. In the following pages, it is our desire to both resist the temptation to either embellish or water down our heavenly experiences just to make them more palatable to skeptical Christians or an unbelieving world. By sharing these true stories as accurately and simply as we can, we believe that you will be able to capture the Lord's great and loving desire to uplift the discouraged, heal those who are sick and bring inspiration, direction and comfort to us all by making the Scriptures come alive through this medium of heavenly dreams and visions; wonderfully enriching our relationship and experiences with Him. In the following pages, we will use the Bible as our plumb-line for setting the precedent as well as the final authority for any revelations received through a heavenly dream or vision. So get ready, because He is a great, great God and Father who loves talking to all of His children; and that means you! *For speaking engagements or information on Heavenly Dreams and Visions simply fill out the form on the Contact Us page. Thank you! ALSO AVAILABLE IN KINDLE E-BOOK VERSION. Bruce and Connie Vyverberg share over thirty years of intriguing, real-life stories, coupled with balanced Scriptural teaching. They explain how the Lord uses His limitless ability to bring direction, provision, healing, correction and even warning through these incredible encounters. You too can learn to hear the Lord speaking through your own heavenly experiences and be a part of His glorious “Last Days” outpouring. This book ends with a sobering prophetic dream of national significance, revealing how our beloved nation’s future is truly hanging in the balance. “It shall come to pass in the last days says God, That I will pour out of My Spirit on all flesh Your sons and your daughters shall prophesy, Your young men shall see visions, Your old men shall dream dreams…I will pour out My Spirit in those days." Redeemed - Inspirati from inspirati on GodTube.